Kroger (KR) stock is trading near a 52-week high at $24. 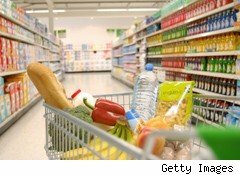 The large grocery store chain has posted a string of strong quarterly earnings. Last quarter, which ended on Nov. 5, Kroger announced net income of $406 million on revenue of $18.7 billion -- a good margin for a grocery business. But Kroger, along with grocery chains Safeway (SWY) and SuperValu (SVU), have a problem -- one that even extends to big box retailers like Costco (COST) and Walmart (WMT). Prices for many of the staples sold by these companies are poised to spike. That will cut margins, unless the costs can be passed on to shoppers. The U.S. Department of Agriculture recently issued its crop report and yield for most agricultural products is expected to be tight in the coming year. Meanwhile, cattle futures reached new highs this week. Compounding the problem, high oil prices will raise the cost of transporting food to grocery outlets. There is hope that job creation could grow as 2011 progresses, which will help some households tolerate price hikes. But the biggest headwind that Kroger and its competitors face is the price of gas. Household budgets are already under siege as gas prices move toward $3.60 and West Texas crude reaches two-year highs. Strained budgets mean the ability to pay higher food prices will be limited, and grocery chains will have to keep prices low to draw shoppers. Kroger may have had a good 2010, but that is unlikely to be repeated this year.